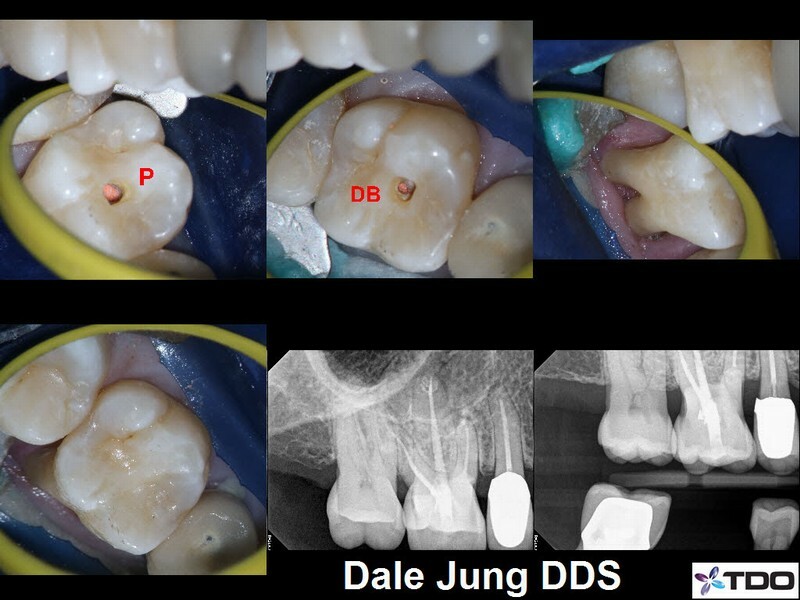 The periodontal probing at the first treatment visit was 12+ mm on the buccal and 9 mm on the distal. 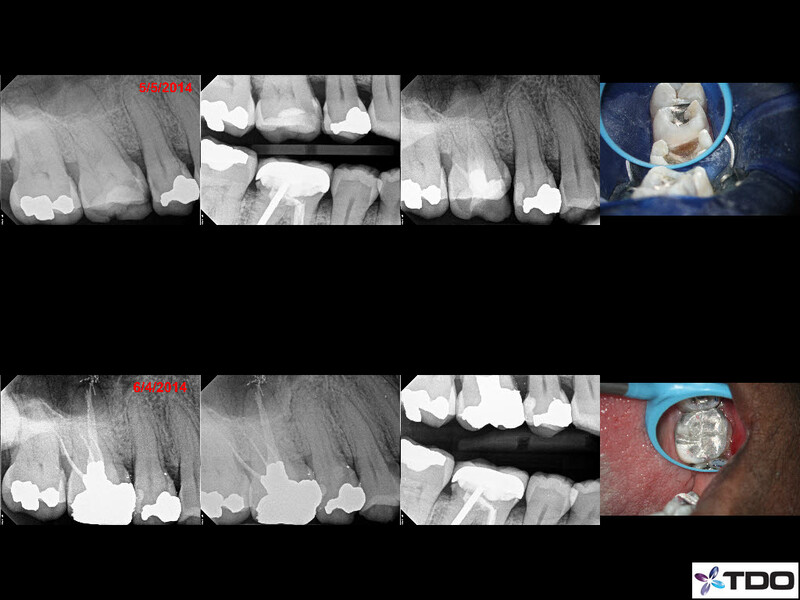 I removed the existing crown and placed a provisional crown following medication of the tooth with calcium hydroxide (CH). I completed treatment at the second visit as the patient was asymptomatic and the periodontal probings were now 3 mm. 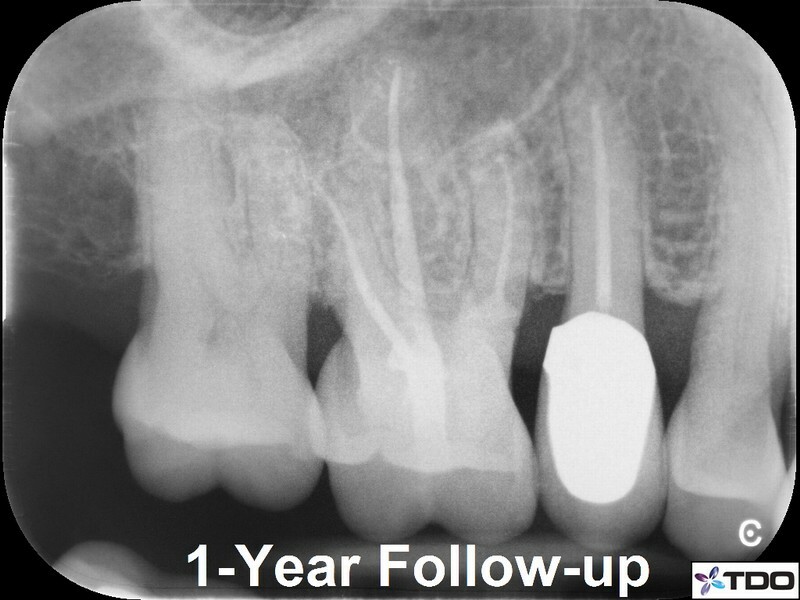 At the 6-month follow-up appointment, the periodontal probings were 3 mm and the radiograph suggests complete healing of the bone. At the 2-year follow-up appointment, the patient reported that she is asymptomatic and the radiograph suggests complete healing of the bone. The middle mesial canal orifice was adjacent to the mesiobuccal canal orifice, however, the middle mesial and mesiolingual canals ended up joining near the tip of the root and they exited the root from separate exit points. The tooth was restored with amalgam to the metal coping. The porcelain was beveled and etched (yellow gel) to maximize bonding of the composite to the porcelain. I restored tooth #18 with a bonded amalgam restoration. As I was able to preserve a significant amount of healthy tooth structure, immediate placement of a crown was not necessary. 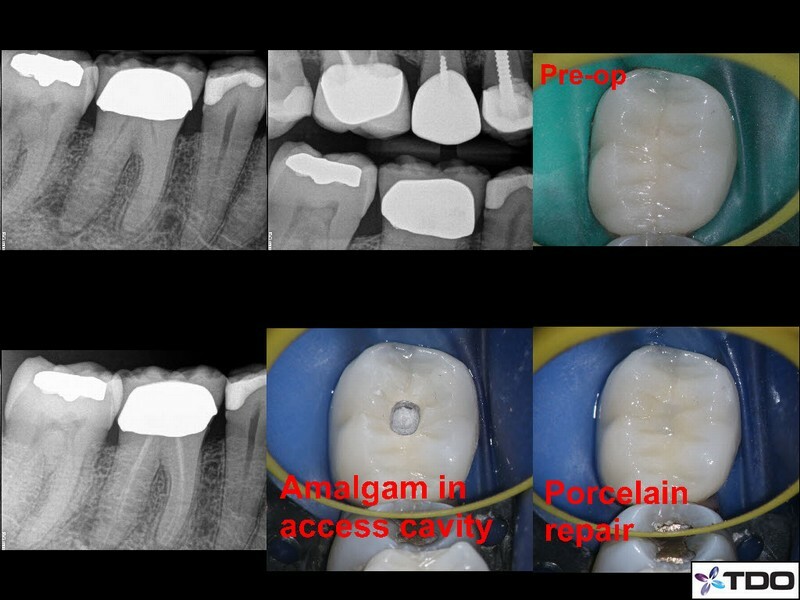 Placement of amalgam restorations will allow, on average, for a longer seal of the root canal system with the aim of increasing the long-term survivability of the tooth. 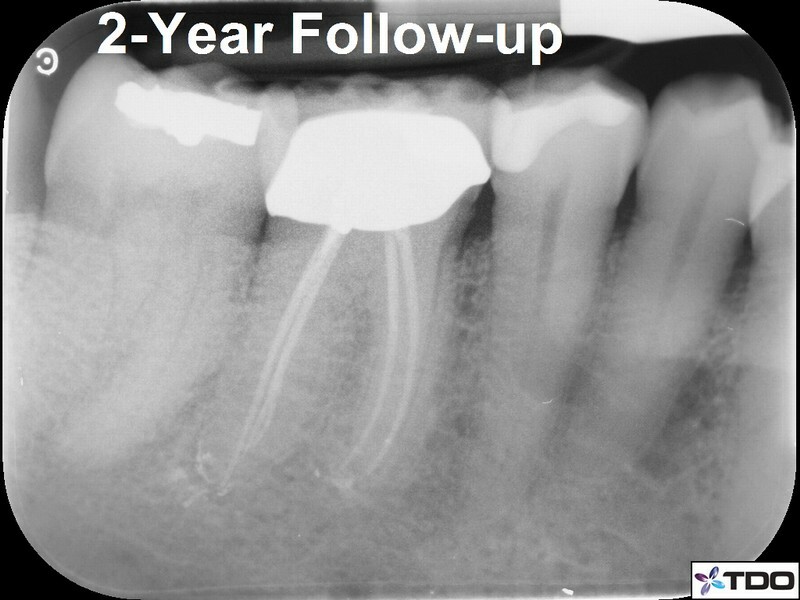 At the 6-month follow-up, the periodontium surrounding tooth #18 appeared normal and the patient was asymptomatic. At the 3-year follow-up, the patient was still asymptomatic; the patient and her restorative dentist decided to place a full-coverage restoration (crown) in the time between visits to our office. 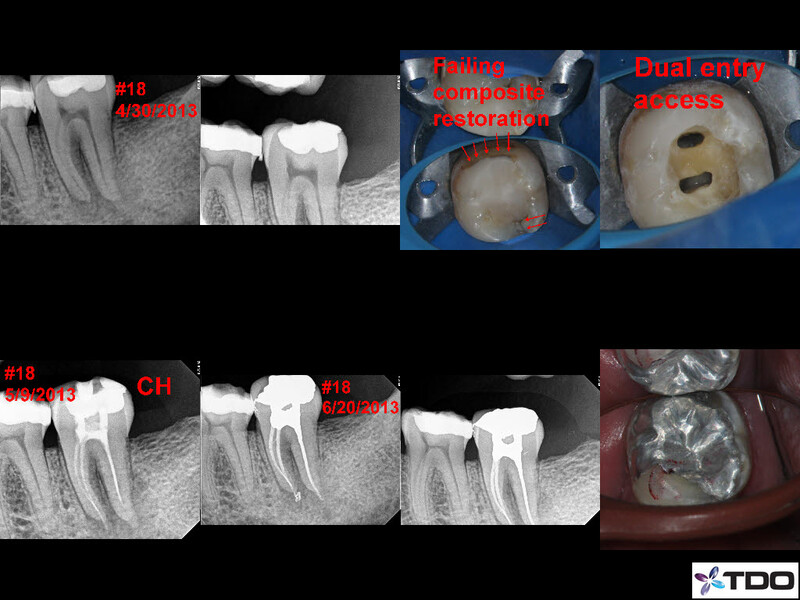 #19 was previously endodontically-treated by another dentist. Note the bone loss in the furcation (the area of bone in between the two roots), which is suggestive of a perforation (hole) allowing communication of bacteria between the periodontal pocket and the root canal system. While endodontic retreatment can be performed with repair of the perforation, the likelihood of a successful outcome is questionable. 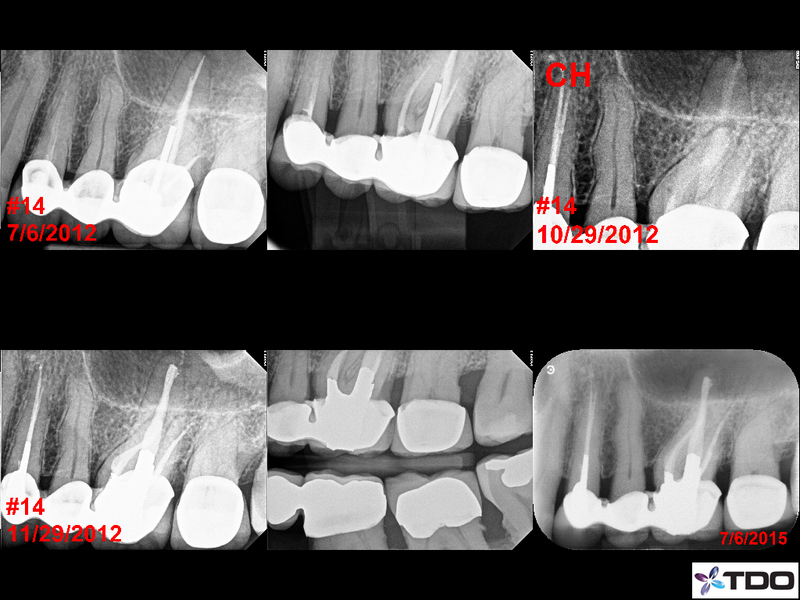 Conservative shaping of the root canal system may have avoided this undesired complication. At the 3-year follow-up, it appears like the area of bone loss is increasing in size; the patient continues to be asymptomatic. 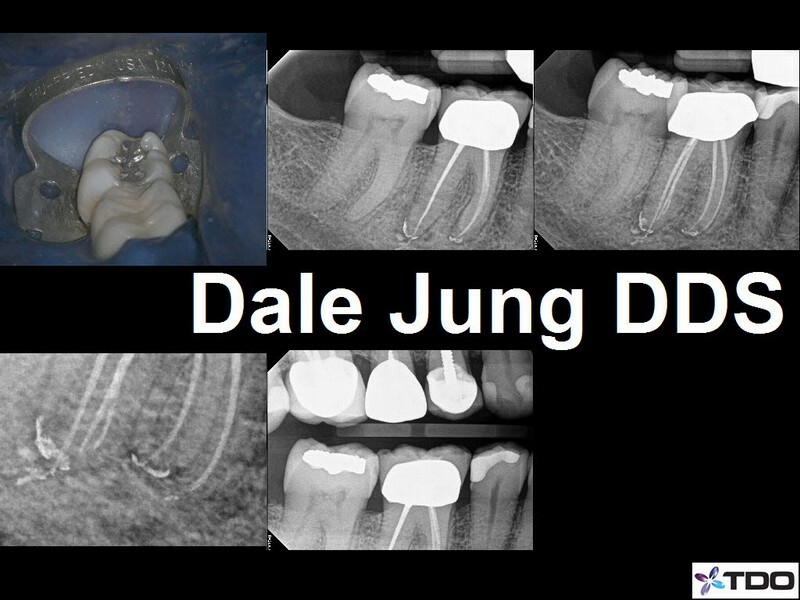 As there was significant healthy tooth structure present, in order to minimize its removal, I made separate access openings for each of the two roots. I placed a bonded amalgam restoration. In order to reduce the load placed upon the tooth during normal chewing, I decreased the size of the occlusal table (biting surface of the tooth). 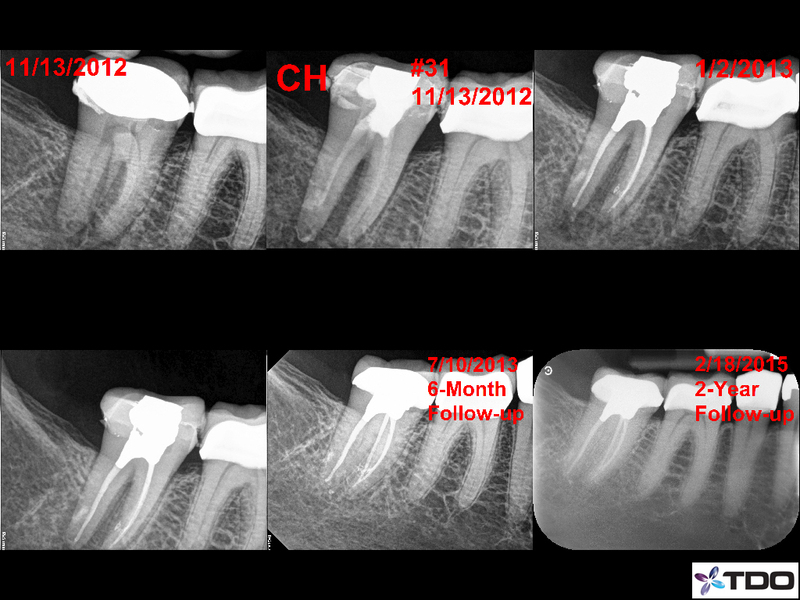 The patient was still symptomatic following initial endodontic therapy of tooth #12, which was performed by the patient's previous dentist. The patient's symptoms had resolved following the start of endodontic retreatment, thus, we completed treatment at the second visit. Note the cement under the splinted (connected) crowns. 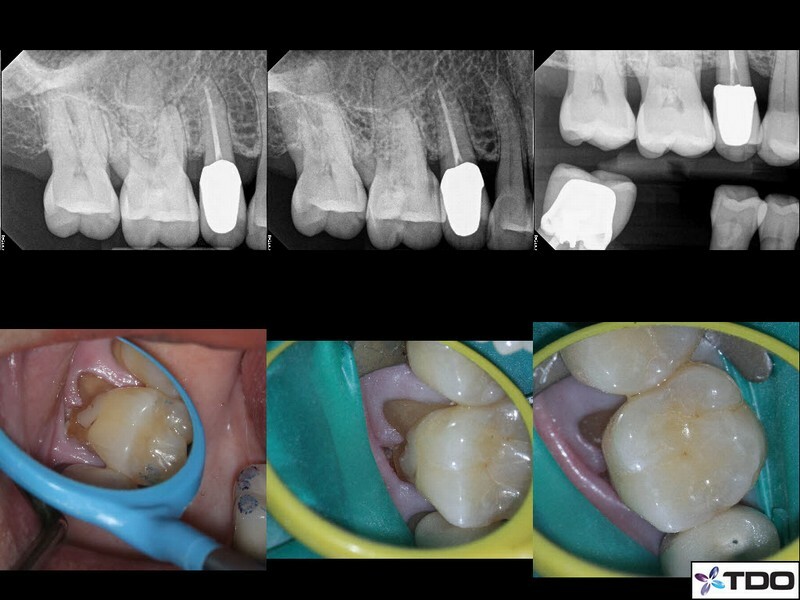 2.5 years after completion of treatment the patient is asymptomatic and he can chew on the tooth with no discomfort. 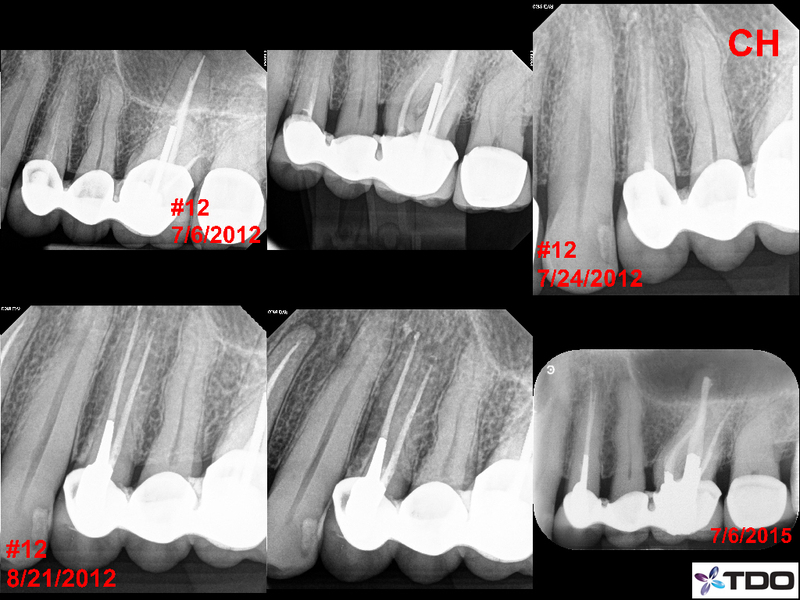 Tooth #14 was also still symptomatic following initial endodontic therapy performed by the same dentist. I observed an untreated, infected second mesiobuccal canal. Note the complex anatomy at the tip of the palatal root. 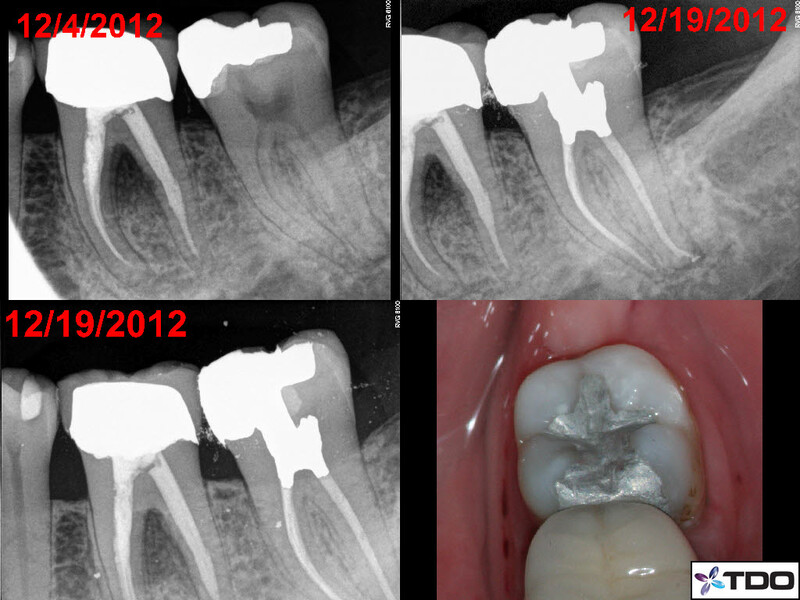 The tooth was restored with a bonded amalgam restoration. The patient was referred to his dentist for new restorations. 2.5 years after treatment was completed, the patient has not received new restorations. I observed evidence of healing of the periodontium (bone and gums) and the patient reported that the tooth is asymptomatic and he can chew on the tooth with no discomfort. 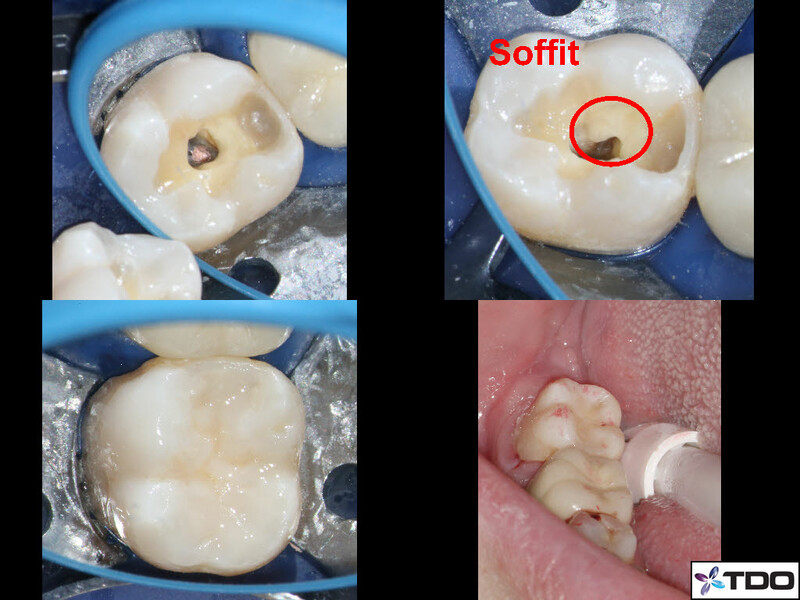 The patient had severe cold sensitivity on tooth #3 due to caries. The first mesiobuccal canal and palatal canals both split in the apical third of the root and exit from separate apical foramina. The second mesiobuccal canal exits from a separate apical foramen from the first mesiobuccal canal system. 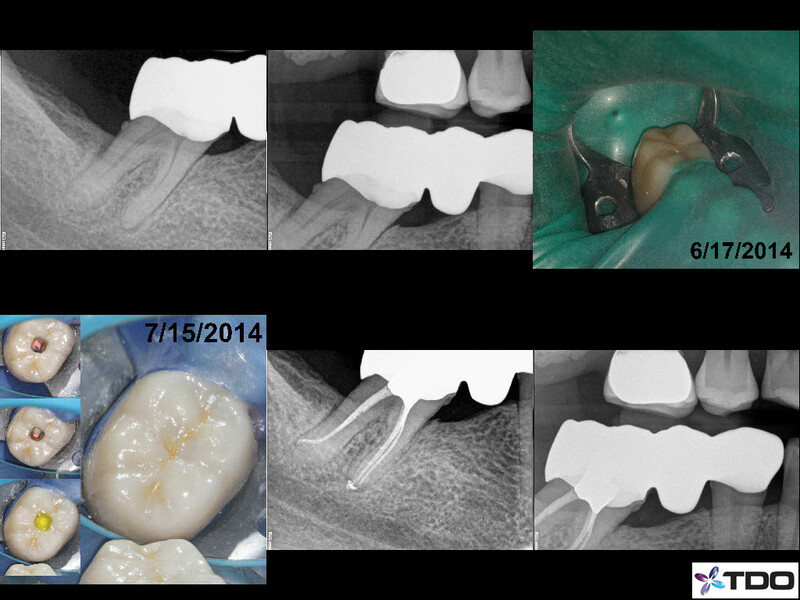 The distal caries on tooth #4 was removed at the first visit. 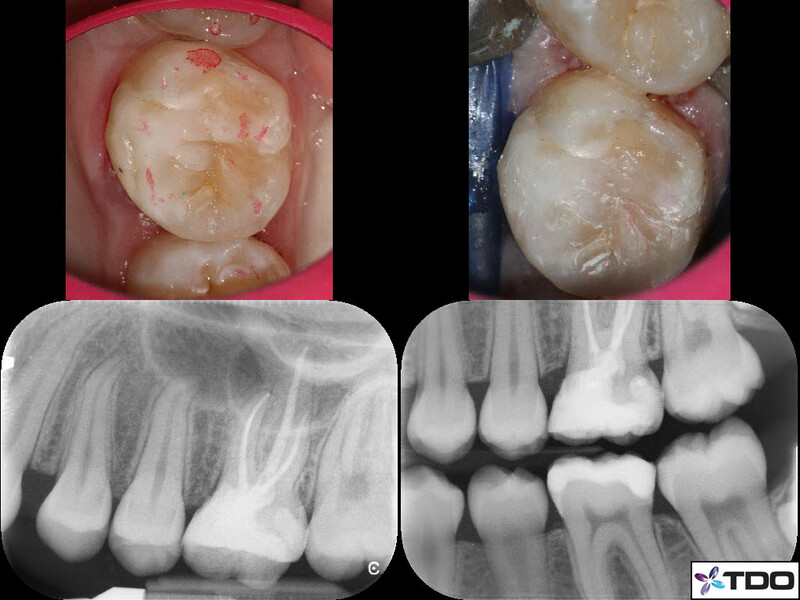 The patient was asymptomatic at the second visit so tooth #4 was restored with a composite restoration and tooth #3 restored with an amalgam with coverage of the buccal cusps. Symptomatic tooth following placement of a 3-unit bridge. 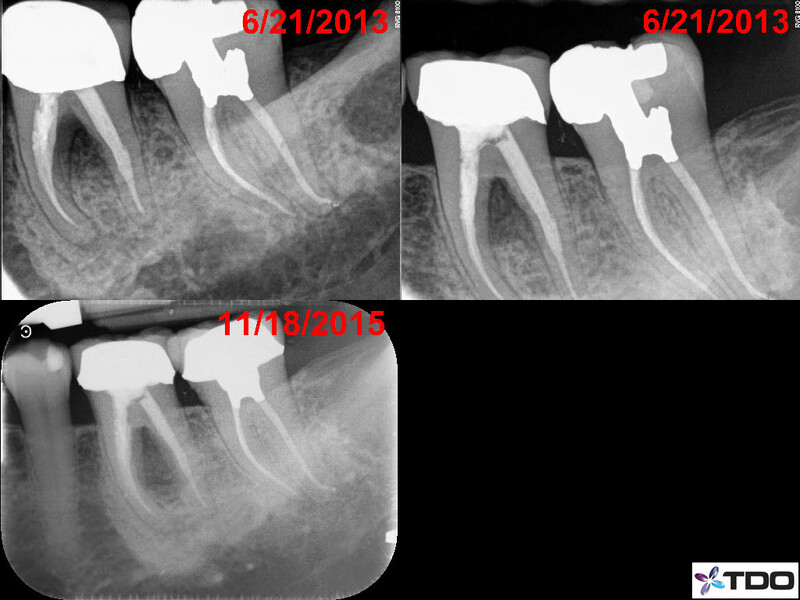 Treatment was performed over two visits to ensure that the patient's symptoms resolved following endodontic therapy. The tooth was restored with a hybrid silver-mercury amalgam and composite restoration. Abrasion of the root surface along with a possible clenching/grinding habit were significant contributing factors in the calcification of the pulp chamber (sclerosis) and second mesiobuccal canal. Tooth #30 (lower right first molar) was extracted recently due to a fracture. 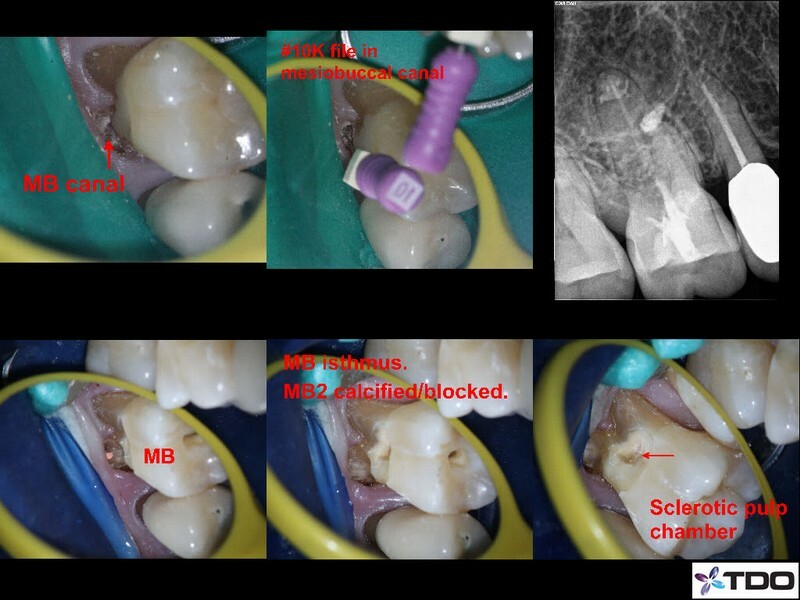 It is likely that subgingival caries on the mesiobuccal root, as well as possible traumatic occlusion with tooth #30, slowly killed the pulp resulting in an endodontic infection. The infection flared up after the first visit. The patient was asymptomatic at the second visit so endodontic therapy was completed and the tooth was restored with a composite restoration. The patient presented with severe pain and swelling. 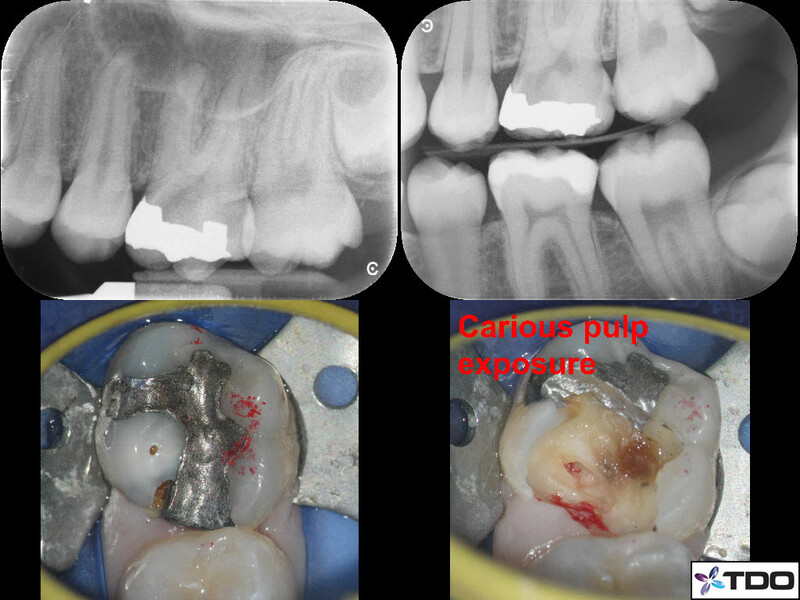 The pulp chamber was severely calcified and purulent drainage was observed after uncovering the canal orifices. The patient was asymptomatic upon completion of treatment. 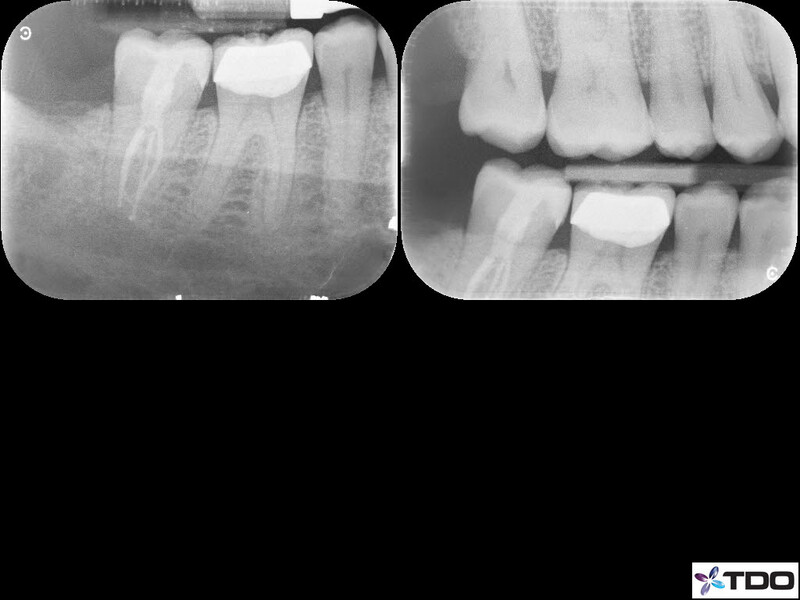 The patient is 14 years old and was experiencing pain due to caries into the nerve of the upper left first molar (tooth #14). 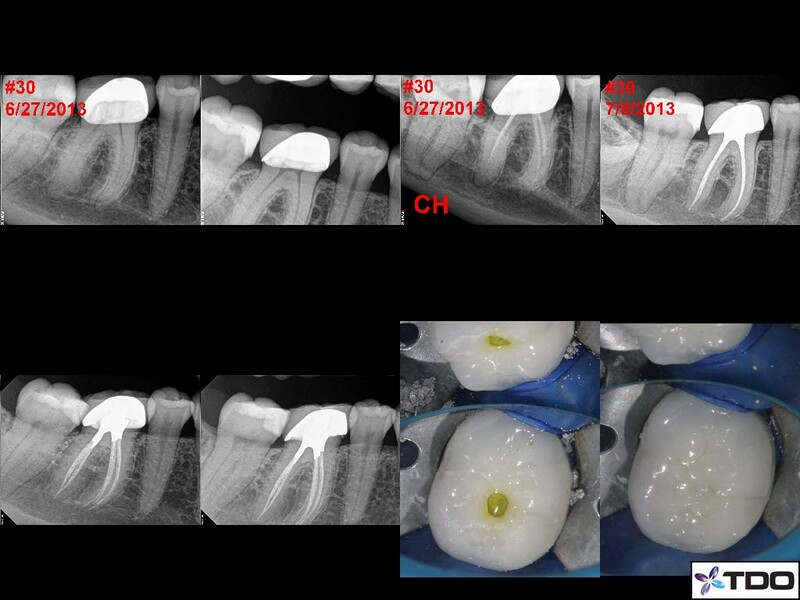 Endodontic treatment was completed in one visit and a direct composite resin restoration was placed immediately to seal the root canal system and to maintain the structural integrity of the tooth. The patient returned one month later for a bite/tissue check. The patient has been pain-free since endodontic treatment was performed. By placing a definitive restoration at the time of endodontic treatment, we can delay placement of a crown until the patient is fully grown. 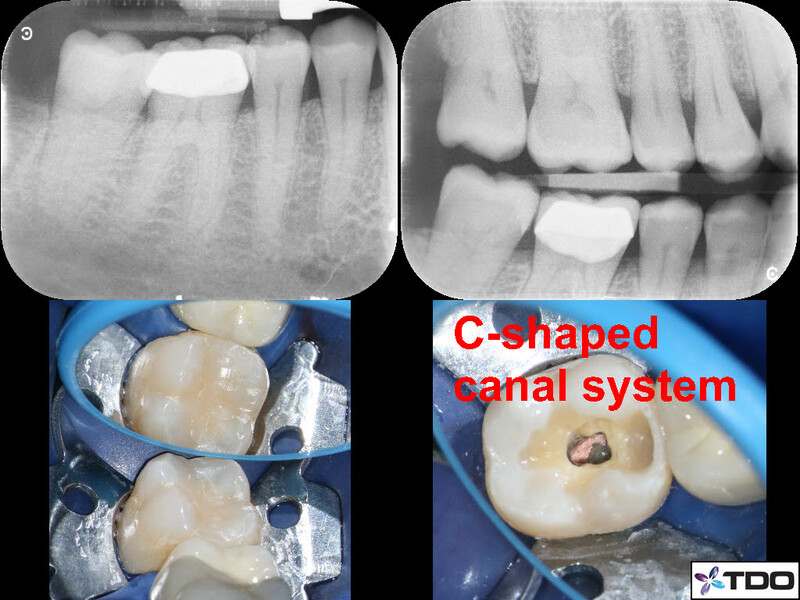 Along with the C-shaped root canal system, the mesial root had a 2-1-2 canal configuration. I preserved the mesiobuccal pulp horn to create a soffit for retention of the buildup material.